Note: I've tried a few pizza dough recipes and this is my favorite one. It is adapted from the Cook's Illustrated recipe. It is a really light dough that makes for a great, thin crust pizza (like the Italian style). I would bake the crust in the oven vs. grilling it because the dough is very elastic and light. If it tears when you're rolling it out, don't worry about it. You'll be making this dough in a food processor, not a kitchen aide mixer! In a large measuring cup with a spout, add 110-degree water. Gently sprinkle in the yeast and let stand for 5 minutes, until the yeast dissolves. Add remaining water and olive oil and stir. In an 11-cup (or larger) food processor with the dough attachment, pulse together the flour and salt. Continue pulsing while pouring in the liquid ingredients (reserving a few tbsp). Add the reserved liquid if the dough doesn't become a ball. Process the dough about 30 seconds longer, until smooth and elastic. Transfer the dough to a floured work surface, knead it slightly and roll it into a ball. 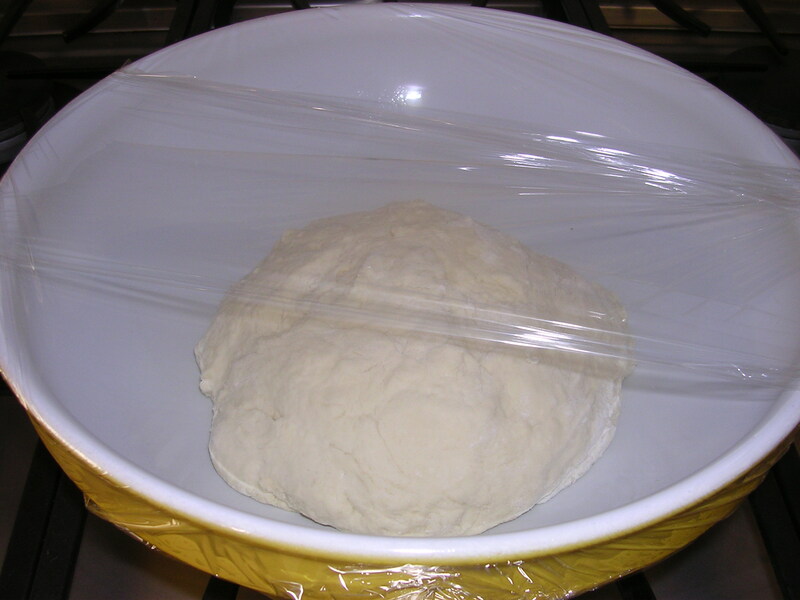 Place dough ball into a large bowl sprayed with Pam. Cover tightly with plastic wrap. Let rise about 1 1/2-2 hours in a warmed room, until the dough has double in size. I usually turn the oven on to about 200 degrees and place the dough to rise on the oven. When dough has risen, deflate it by punching it with your fist. Divide the dough into 3 even balls and freeze or roll it out and bake your pizza immediately. Makes dough for 3 pizzas.